As the last days of summer wind down, the web team would like to introduce a couple new features we’ve just added to the CQ/AEM content development toolset, which should provide direct benefits to our end-users. For some time now we’ve been in need of new campus map to help patrons find their way to our many libraries, collections, and service points. So we’ve just rolled out a customized Google map designed to address that need. 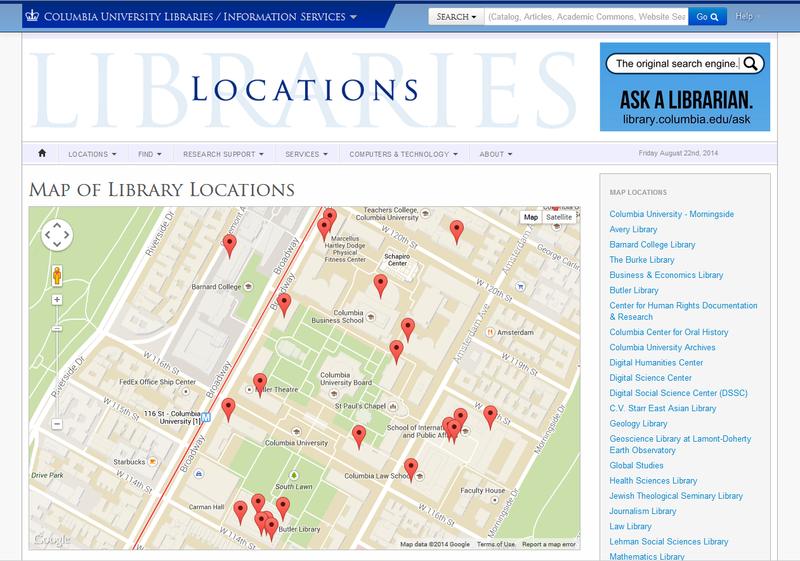 The data displayed in the information boxes on the map is pulled from our existing Location Entry pages and Hours Manager, which already populate LibraryWeb sidebars. This information will always be consistent throughout the site, and can be updated at any time. 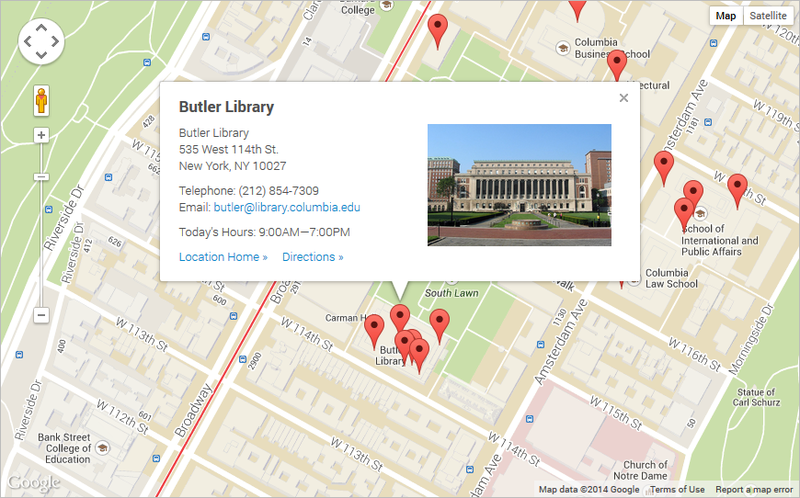 Links to the map can be set to automatically highlight a particular location. Additionally, the same component we’ve built to generate the Libraries map can also be used on any page to highlight a single location. Another piece of functionality many of you have requested is the ability to allow users to easily share our content with other users. So we’ve created a ShareThis widget component for just this purpose. The component can be customized to enable sharing via up to 10 different social media channels. In the coming weeks we’ll be updating the CQ/AEM User Guide to include details on when, where, and how to take advantage of these new components. If you’re interested in a hands-on demonstration, sign up for our upcoming CQ/AEM Workshop on Sep. 24th. In coordination with the Libraries’ communication office we’ve recently published new Visual Identity & Website Guidelines, which can be found in the Web Development section of StaffWeb. LibraryWeb, Hours Manager, CUL Blogs, and most of CUL’s existing web properties are already designed in alignment with these principles, but CUL’s online presence is increasingly diversified with new web applications, collaborative blogs, hosted services, and other web initiatives. These guidelines will help ensure consistent branding, navigation, and content rendering as new CUL web properties are brought online. Feel free to send any questions or comments about the guidelines to the WCM Help Desk (cul-wcm@columbia.edu). This entry was posted in Websites (CQ/AEM) on August 29, 2014 by Dmitri. Unnecessary websites, consoles, tabs, buttons, links, and other features have been hidden to provide a less cluttered, more focused experience. Searches can now specify criteria in addition to keywords, such as Modified Date, Template, or Tags. Numerous page and asset editing actions can now be undone/redone, such as creating, and deleting components, or editing a component dialog, even after changes have been saved. Many CQ/AEM interface actions can now be performed via common keystrokes, such as copy, paste, and undo. Quality and speed of digital asset ingestion into the DAM has been increased, automatic extraction of asset metadata has been improved, and there is enhanced support for Microsoft Office documents. Pages can be scheduled for automatic Activation or Deactivation at a future date and time. Broken links are now clearly marked with a red symbol on pages in the authoring environment. On the back-end, the new version is significantly more robust and resistant to data corruption, so the uptime of both our authoring environment and public websites should go up. System configuration options have been reworked to simplify setup and maintenance, and new developer tools and libraries should allow us to more easily extend WCM with custom components, reports, and applications. The LDPD web team will continue to use these building blocks to improve the CQ/AEM content authoring experience. Currently we’re working on better contact management, improved support for video assets, and syncing the CQ/AEM login with your standard UNI/password. We’re always interested in hearing feedback from contributors, so please don’t hesitate to let us know about new things you’d like to do or ways you think the content authoring experience could be improved. This entry was posted in News and Updates, Websites (CQ/AEM) on April 18, 2014 by Dmitri. I will be conducting a Creating Content and Writing for the Web series that will cover the different kinds of content on our websites, best practices, things to think about, and how to approach a content refresh for your page, section, site, and beyond! Stay tuned for dates and times, as well as a more complete syllabus. I am currently estimating 2 – 3 sessions. A brown-bag discussion about upcoming features and development work being done in both Adobe CQ/AEM and WordPress that aim to enhance our websites, enrich our users' experience, and ease your experiences authoring content for our websites. This entry was posted in Blog Posts, Training and Workshops, Websites (CQ/AEM) on February 11, 2014 by Candice. We have a lot of upcoming opportunities for you to become more familiar with using CQ/AEM! Please join us for one or more of the following sessions in 306 Butler (first come, first served unless otherwise noted). Monday, 3 February, 3:30 – 5:00 p.m.
Tuesday, 4 February, 2:00 – 3:30 p.m.
Thursday, 6 February, 1:30 – 5:00 p.m.
Wednesday, 12 February, 2:00 – 3:30 p.m. This entry was posted in Blog Posts, Training and Workshops, Websites (CQ/AEM) on January 31, 2014 by Candice. Hello! 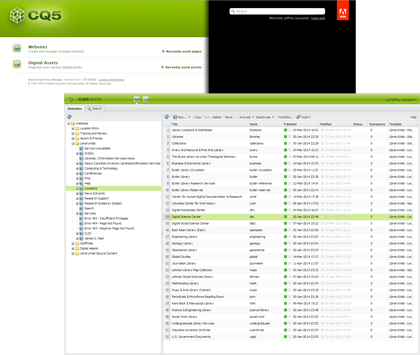 We are excited to bring you the new version of Adobe CQ, now called Adobe Experience Manager (AEM). While the core functionality remains the same, the interface enhancements and new functionality are all very welcome improvements. The login and welcome screens have been redesigned and rebranded by Adobe, and the Website and Digital Assets Consoles offer additional tabs for greatly enhanced Search functionality. To go to a page that you were recently editing, simply click the Recently used pages link and select the appropriate listing. For Recently used assets, click that link and select the appropriate asset. The Website Console and the Digital Assets Console both have new Search Tabs available allowing you to search for and then work with content and assets. As you can see, there are many ways to limit and control your searches. We are excited to bring you this enhanced service and look forward to seeing you at next week's introductory sessions! This entry was posted in Blog Posts, Transition to New Web CMS, Websites (CQ/AEM) on January 31, 2014 by Candice. This entry was posted in Blog Posts, News and Updates, Transition to New Web CMS, Websites (CQ/AEM) on January 31, 2014 by Candice. 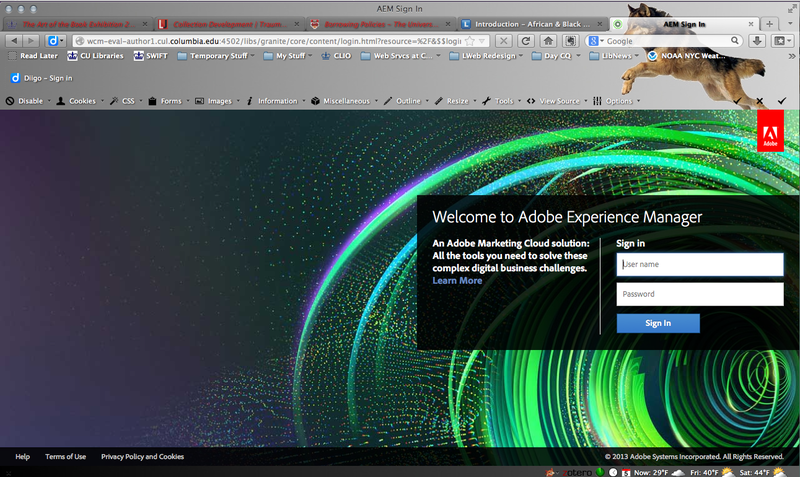 We are continuing to work on upgrading from Adobe CQ 5.4 to Adobe Experience Manager (AEM) 5.6.1! Thanks to those who helped us test last week. The Content Freeze is next week, so please note the dates that CQ will not be available for changes and updates. Beginning the following week, we will host several open sessions to orient you to the upgraded system. These will be held in 306 Butler and will be first come, first served. If they over-fill, we will host more. I also am scheduling a full AEM/CQ Training Session between the 6th and the 12th of February (exact date and time will be announced ASAP). Please note: if you are comfortable using CQ, you may not need the orientation. Watch for updates over the next week! This entry was posted in Blog Posts, Maintenance and Outages, Training and Workshops, Websites (CQ/AEM) on January 23, 2014 by Candice. CQ Upgrade Schedule, Short Content Freeze, & More New Opportunities! For the many who have responded asking if another Working with Subject & Courseworks Guides in CQ will be offered, the answer is yes! One is being scheduled for February, along with other sessions covering specific aspects of creating and working with website content. The schedule for trainings will be sent out next week. This entry was posted in Blog Posts, Maintenance and Outages, News and Updates, Websites (CQ/AEM) on January 16, 2014 by Candice. 2014 has arrived with a blast of arctic air, while we all prepare for Spring Semester! We are looking forward to installing the most up to date version of our web content management system (Adobe CQ) in late January. The upgrade will not be a drastic change, but it will bring a number of noteworthy improvements to both contributors and system administrators. In February, we will hold a full Introduction to CQ training as well as a number of open sessions to introduce you to What's New in CQ/AEM 5.6.1. Check back for dates and times and more information. You are invited to attend our Working with Subject & Courseworks Guides in CQ session from 2:00 – 3:30 on Wednesday, 15 January 2014, in 306 Butler for anyone who would like to attend. The session will cover the nuances of working with your guides as you prepare them for Spring Semester classes and will cover some of the more advanced functionality, such as how to use the same content in more than one guide. Now that the site has been redesigned and the guides are centrally located, it's a good time to update, add resources, and create new course- and subject-specific guides. All are welcome! This entry was posted in Blog Posts, News and Updates, Websites (CQ/AEM) on January 9, 2014 by Candice. 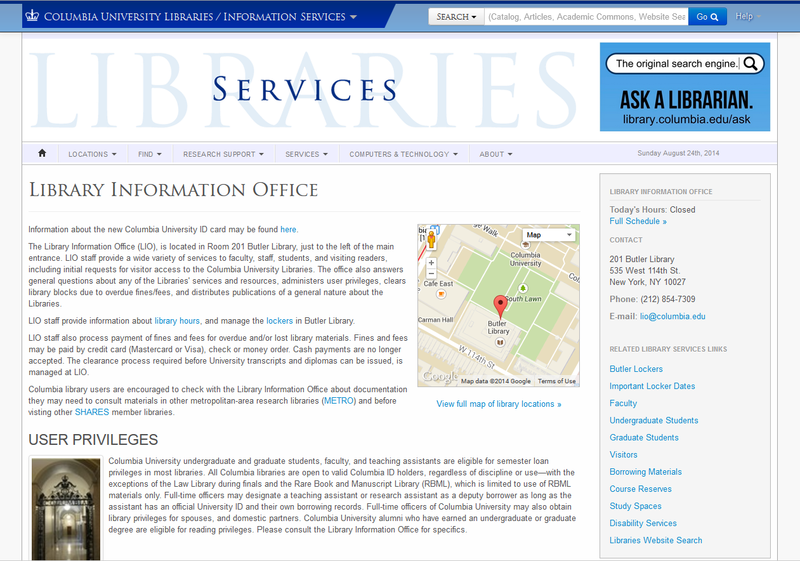 One of the many places to which we’ve applied the new LibraryWeb design is the Training and Review area within CQ. This is the place which is used as a practice area during CQ training sessions, and can be used for a variety of content development scenarios at any time afterwards. 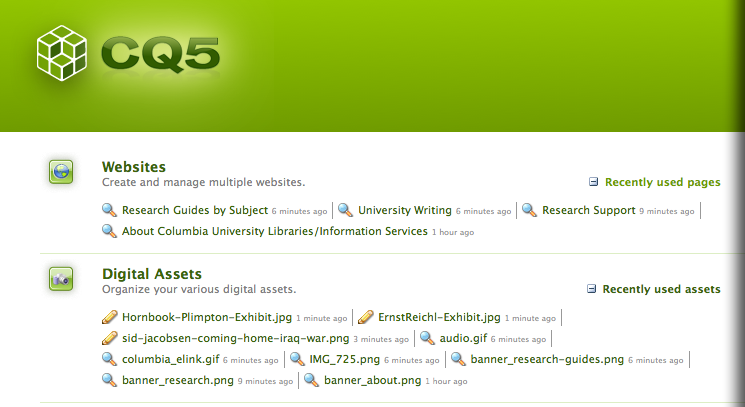 Every CQ content contributor has their own content tree in the Training and Review area, which by default includes sample pages for both LibraryWeb and StaffWeb. If you’d like to use this space to develop content for Alumni/Friends or BTS, just send a request to the WCM Help Desk and we’ll provide you a set of sample pages with the appropriate design. 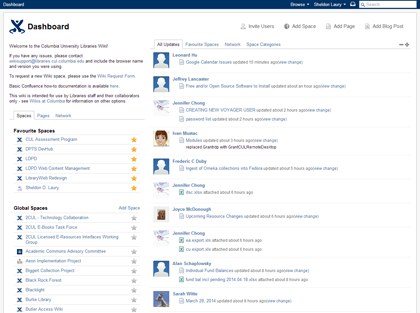 In CQ, develop new content in your personal folder in the Training and Review content tree. Activate the page(s) you want others to review. Navigate to your personal area and locate the page(s) you want to share with others. Copy and paste the URL of the published page(s) into an email to give others direct access to the pages you’d like them to review. If you need to restrict access to the published pages, for example to people with Columbia IDs, or if you need any other type of assistance using the Training and Review site, please contact the WCM Help Desk. We’d love to hear your feedback on the new Training and Review site, and learn how you think you might use this in your content development efforts. If you have any ideas about how we can improve this area and make it more useful to you, please don’t hesitate to contact us. This entry was posted in Websites (CQ/AEM) on July 22, 2013 by Dmitri.